"Father/son talents Walter Dean Myers and Christopher Myers teamed up to create a beautiful exploration of musical blues (Holiday House, 2003). The elder wrote and Christopher illustrated this deeply symbolic tale. A collection of blues verse follows an in-depth introduction that studies the historical roots and the musical elements of blues. The call-and-response text is brought alive by narrator Richard Allen's enthusiastic rendition of the text, accompanied by simple blues instrumentation. Although this title provides a wonderful introduction to blues music, it will be appreciated by those who have thoroughly studied the subject as well. The illustrations and text, sometimes paired with a hauntingly lonely harmonica, explore such subjects as poverty, lynching, slavery and injustice. One verse reads: "Heard the top deck groaning, yes, and the ocean roar / Heard my brother crying till I couldn't hear no more / O Lord, O Lord / Ain't it hard when your brother's crying / And you don't hear him anymore?" The subjects are serious and sensitive, but perhaps the first verse in this collection ultimately sums up the books intention: "Blues, blues, blues / Blues, what you mean to me? / Are you my pain and misery / or my sweet, sweet company?" Appropriate for group or individual listening, this title is best utilized with adult guidance to help with the blues glossary in the back of the book. An essential addition to school and public library collections." "By itself, BLUES JOURNEY is an enticing and provocative book. Once you've heard this recording, however, it will be impossible to consider it complete without the voice and music of Richard Allen. With the same articulation that Myers brings to his discussion of the evolution of the blues as a musical form, Allen brings depth to the poetry; he evokes the pain or joy of each poem through his deliberate, soulful reading and expressive musical accompaniment. This is a total experience, and the listener comes away wiser, richer, and uplifted." "Enslaved Africans brought the blues to America. Even though the musical art form has evolved and absorbed elements from other cultures, blues music is still defined by haunting lyrics and swinging rhythms that tell intensely, personal stories. Allen's soulful reading of Myers' poetic picture book is magnificent. 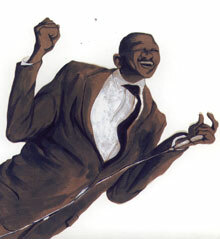 The accompanying music, composed by Mark "Dog" Deffenbaugh to reflect different periods of blues music, helps make the verse dance off the pages, which feature memorable collage artwork by illustrator Christopher Meyers. Deffenbaugh and Rory Young play a variety of instruments (guitar, tambourine, drum, organ, piano and harmonica) and sing backup. Narrator Allen alternates between reading and singing the blues-inspired verse. He impressively sings such lyrics as "the thrill is gone, but love's still got my heart"; blackbirds fly, hound dogs howl and bark"; and "my landlord's cold," among others. Allen is an emotional narrator, and listeners will sense his appreciation for the blues and the troubled times and hearts from which this music sprang. Rolling wagon wheels, screaming seagulls, a ship's groaning hull, and other background sounds further transport youngsters to times and places that inspired the blues. The audio concludes with a blues time line and glossary."